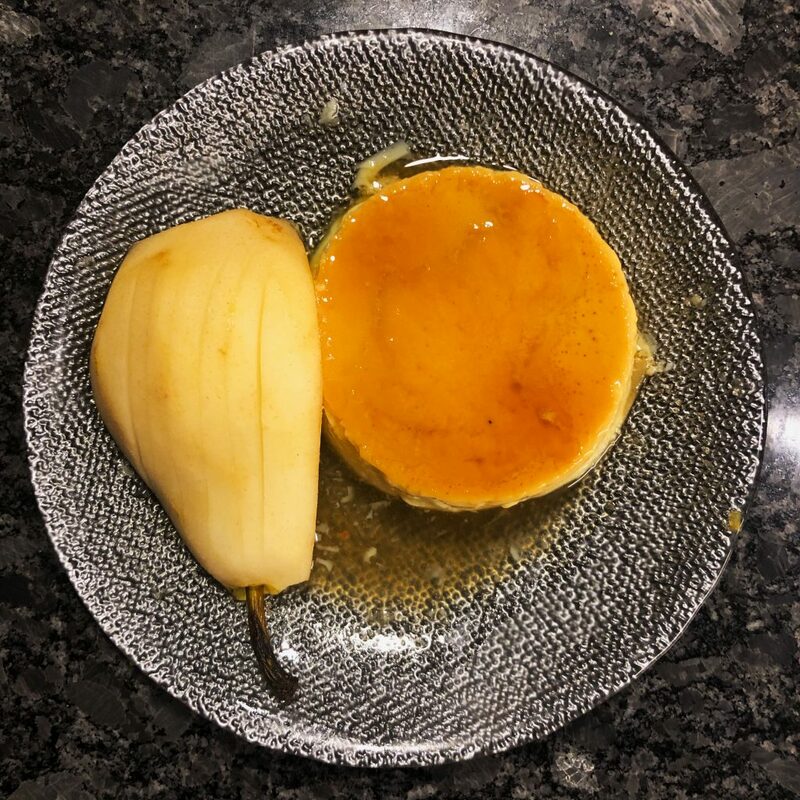 This recipe for a “Honey Creme Caramel with Pear” is inspired by a couple of things – my childhood memories of custard and jelly, recent desire to bake after binge watching The Great British Baking Show on Netflix and my need to experiment, hence the honey and pear. In the end it all came down to making a dessert that took little elbow grease and looked elegant. Custard and jelly is a combination of desserts so deeply intertwined with each other that it’s often hard to think of one without the other. It wasn’t always so. English cooks over centuries worked out how to use gelatin from different sources to make a wobbly jelly. The resulting jellies were used to fill both savoury and sweet pies and eventually to make the well known dessert simply called Jelly. Now you know how much attention I’ve been paying to Mary Berry and Paul Hollywood’s pearls of wisdom! In my childhood home, our mother would often make custard and jelly. The custard was usually vanilla flavoured while the jelly a bright pink – a strawberry flavour or the like. The struggle was always to get the jelly right. Custard was easy. The powder came out of a box and a mixture was prepared with a tablespoon of cold milk while the rest of the milk simmered until boiling. Eventually everything was mixed together, sweetened, cooked until thick and then cooled. Fast forward a decade or more I couldn’t find a custard powder in any grocery aisle at the local supermarket in my town in New Jersey. It seemed to me that Americans didn’t make or understand custard at all. Puzzled and craving custard I started looking for recipes online. I did find custard recipes, Mary Berry has one, but it needed corn starch. So instead I moved on and settled on trying a recipe for creme caramel. 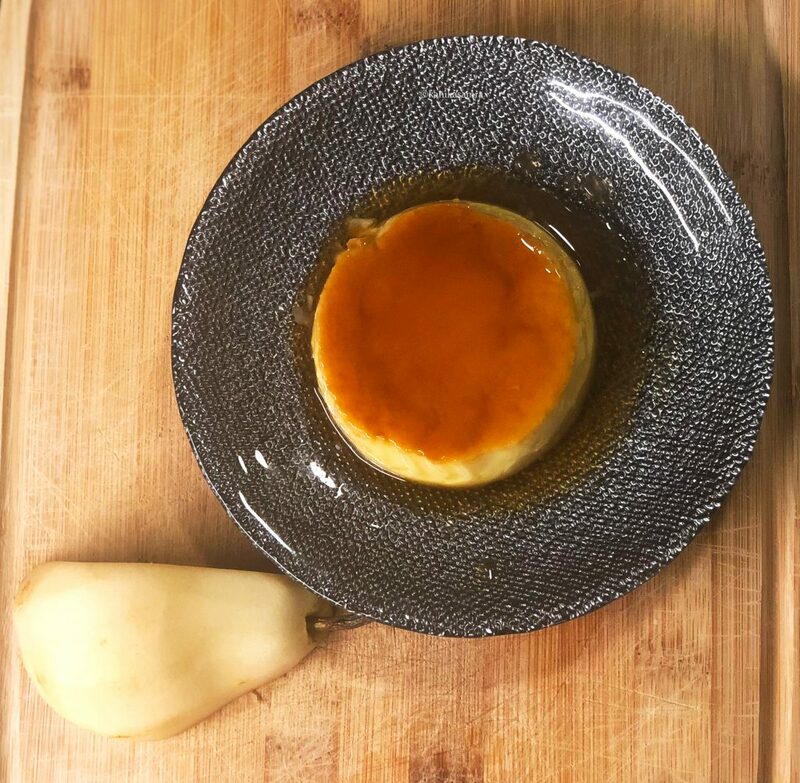 Since then I’ve made creme caramel at least half a dozen times, including some hits and misses on the caramel end, usually with satisfying results. First of, each one of them is a form of custard. They all use eggs or cornstarch and in some cases gelatin as thickening agents. 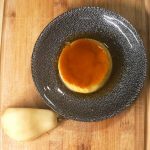 Flan and creme caramel are very similar in their preparation except for a few changes in the ingredients. Most flan recipes use both evaporated milk and sweetened condensed milk. Whereas creme caramel recipes, I adapted Mary Berry’s recipe, use only whole milk with eggs and sugar. The rest of the preparation is similar and they are served upside down, out of the mold so that the caramel is on top. Creme brulee on the other hand is often served in the ramekin with a crust of broiled or torched sugar. Chowhound does a good job of breaking down these minor differences. One kind called Lagan Nu Custard is a wedding dessert. The word lagan is shared among many Indian languages. In addition to its common meaning of devotion, diligence and studiousness, it also connotes wedding. It is customary for lagan nu custard to be served at a feast for Parsi weddings. 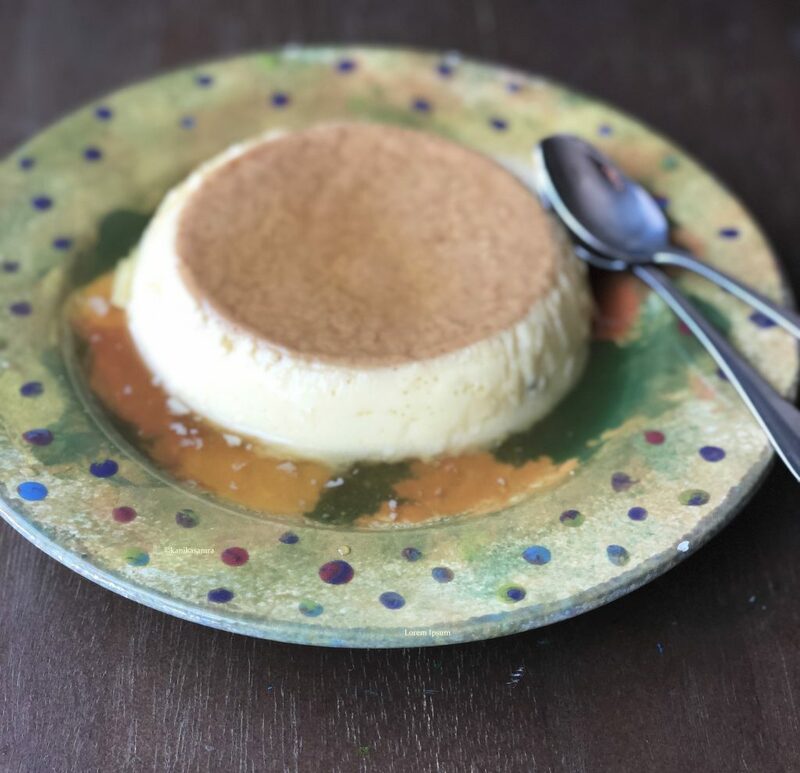 Similar to most other custards, this one is usually garnished with nuts and flavoured with saffron and other spices like cardamom. 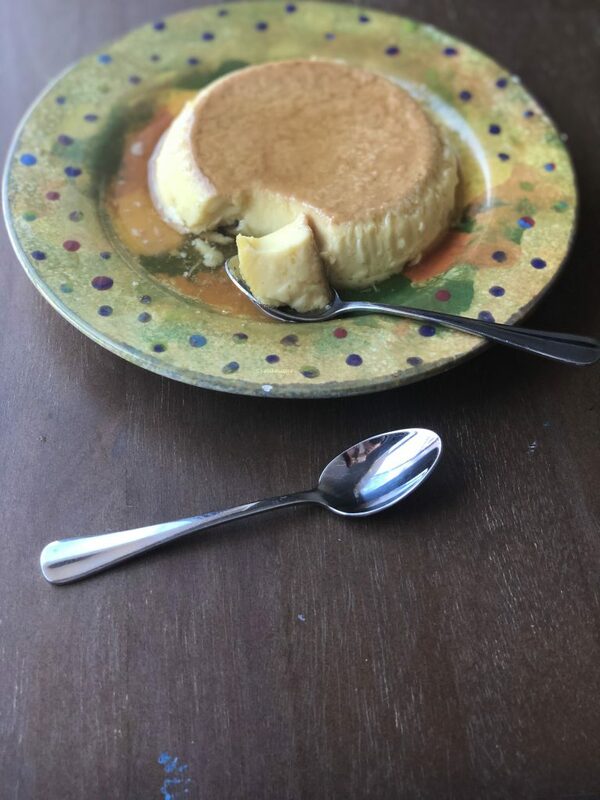 After all that binge watching and romanticizing about the pots de creme, creme caramels and custards that bakers and judges described and tasted each week on the Great British Baking Show, I was energized to bake my own. If Lagan nu Custard was part one of my experiment with custard then this is part two. Ramekins, a baking tray, sieve, whisk and mixing bowls. Before you begin preparing the ingredients, preheat the oven to 300 F. Fill a baking tray with water, 2 to 3 inches deep and let it stand in the oven. This way it is ready to use with warm water in it. Alternatively, you could add boiling water from a kettle just before baking the creme caramels. If you refer to Mary Berry’s recipe, her instructions are to always start with caramel first. 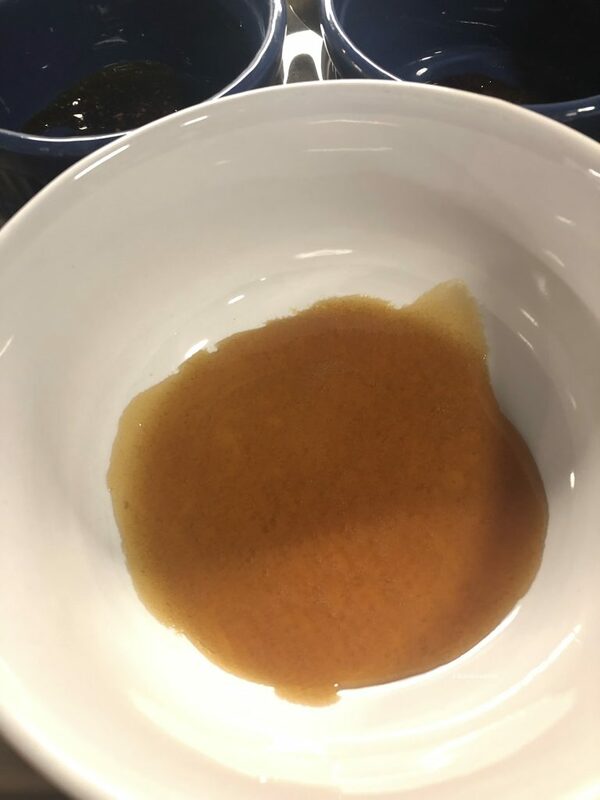 Two reasons – a) its very easy to burn and get it wrong because sugar has a way of crystallizing soon after its caramelized if stirred after its cooked, b) the caramel needs to line the bottom of all ramekins or tins being used. I decided to use honey in the caramel to add an earthy and slightly bitter tang to it. To make the caramel use a clean, stainless steel pan. Add sugar to it along with the water and warm it up on medium heat until all the sugar dissolves. Add honey and continue to cook until the mix turns a deep golden colour. Remove from heat and pour into ramekin right away. Let it sit at room temperature while you prepare the custard. Using pears is entirely optional. 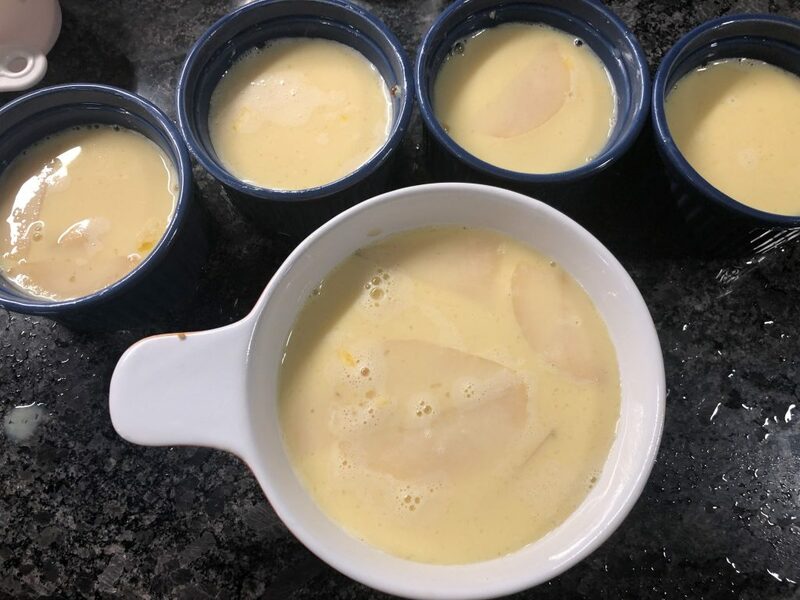 I chose to slice them and line the ramekins with pear slices before adding the custard mix. They will float up while baking. If you want to replace it with another fruit be sure to think about the water content. 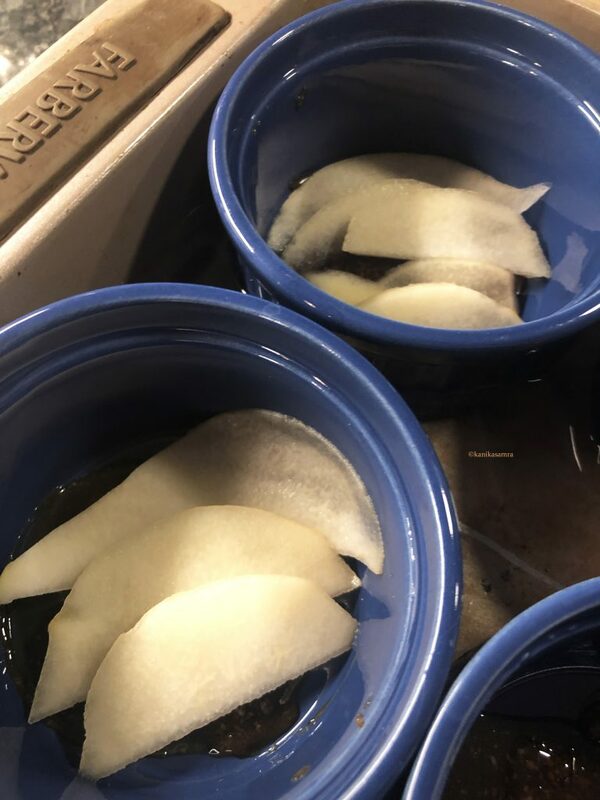 Pears do not release a lot of water and so the custard sets within 30 minutes. But other fruits might need longer and that will impact the texture of the final creme caramel. Butter sides of the ramekins above the caramel. I do not always do this, but Mary Berry recommends it. 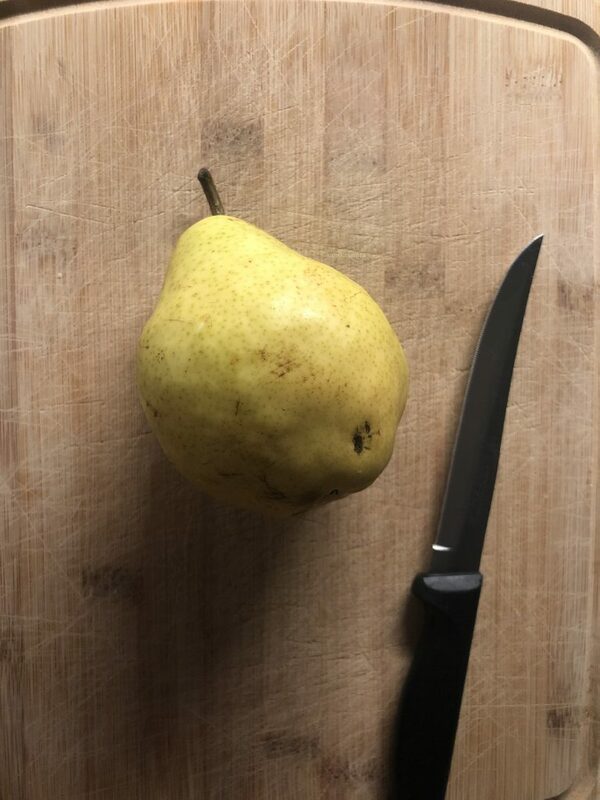 A pear for the creme caramel. Slicing a pear for the creme caramel. Cardamom for flavouring the creme caramel. After the caramel is done turn your attention to preparing the custard mix with milk, eggs, saffron, cardamom, vanilla essence and sugar. In a bowl whisk together eggs, sugar and vanilla extract. Next, in a saucepan pour all the milk. 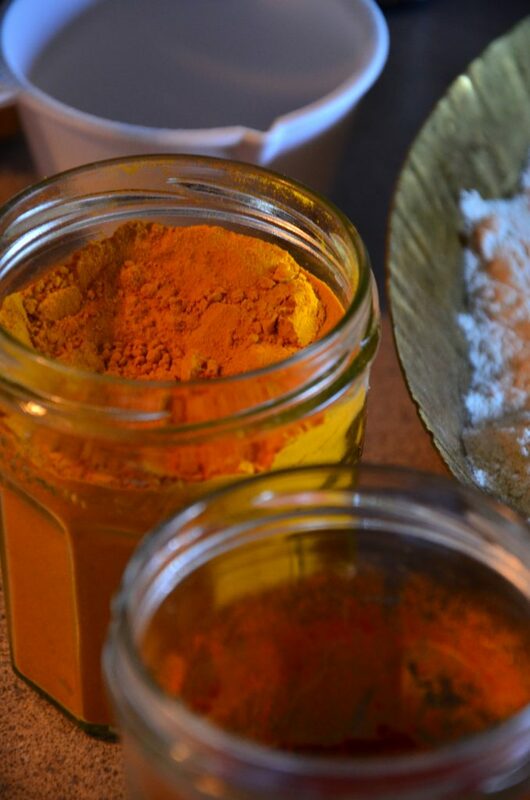 Add saffron strands to it and one crushed cardamom pod. Warm on medium heat until you can barely dip a finger in it without burning. Do not boil. 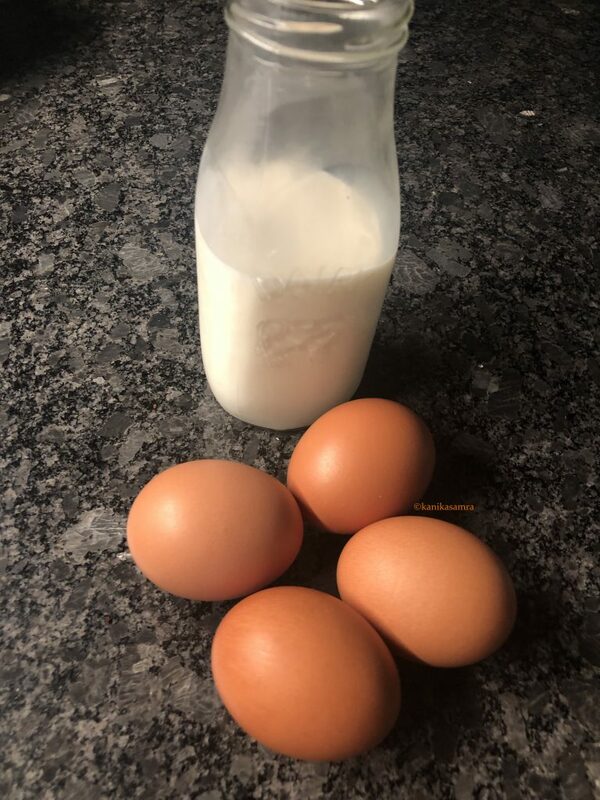 I let the milk sit for a minute or two, off the heat, to cool before pouring it into the eggs. Sieve the milk into the egg mix and gently stir in. 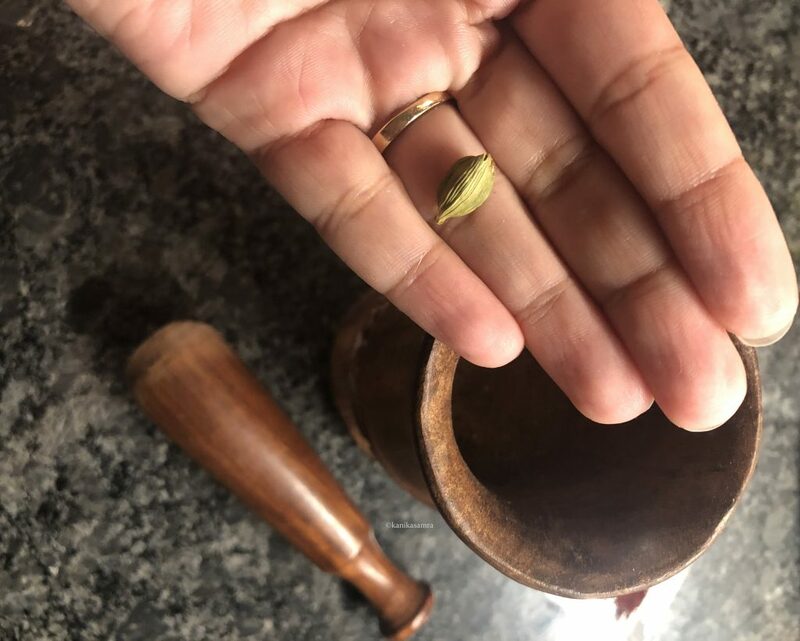 You can wash the cardamom pod and use it in a masala chai. Next, pour the mix into ramekins, filling them 3/4th of the way up. Transfer ramekins to the baking tray with its water bath. Bake on the center rack in the oven for approximately 30 minutes. To check whether they are ready, insert a cake tester or toothpick in the center. It should come out clean. Preparing ramekins for creme caramel with honey caramel and pear slices. Once baked, let the ramekins cool down on the kitchen counter. Then chill them in the fridge before turning out and serving. Before flipping the ramekins run a thin knife around the sides, then place a plate on the mouth of the ramekin and turn over. The caramel should rush out and create a puddle. The rest should be on top as a shiny, amber layer. 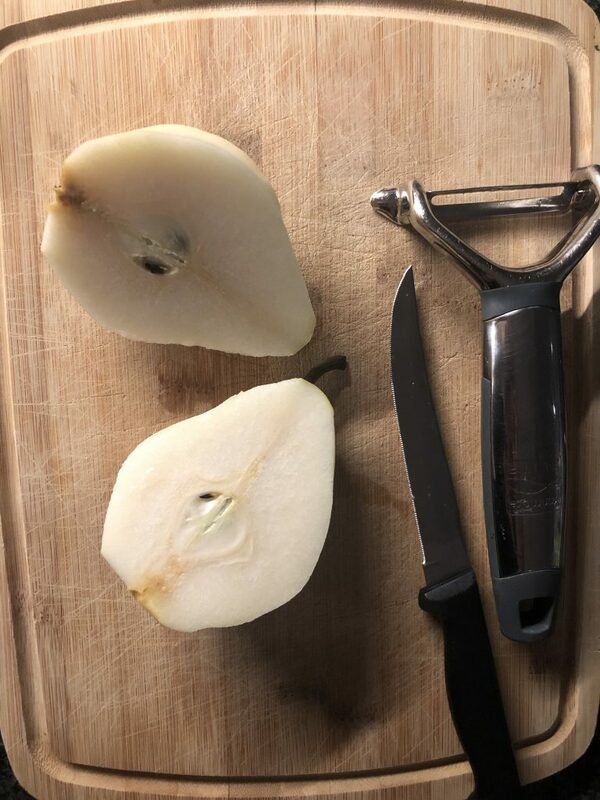 Pear slices will be at the bottom, a surprise to cut while eating. Great for dinner the same evening and two days down the road! The large one below was served two days after baking. Two days later – still as tasty! An easy twist on Mary Berry's classic creme caramel with a honey caramel and sliced pears. It also has saffron and cardamom for an added layer of flavour. 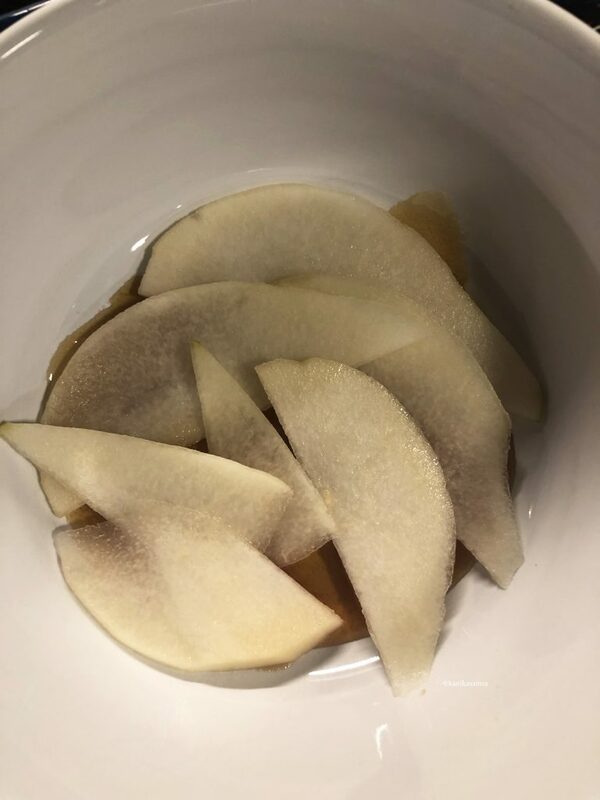 1/2 a pear sliced - optional. Fill a baking tray with water, 2 to 3 inches deep and let it stand in the oven. To make the caramel use a clean, stainless steel pan. Add sugar to it along with the water and warm it up on medium heat until all the sugar dissolves. Add honey and continue to cook until the mix turns a deep golden colour. Remove from heat and pour into ramekin right away. Let it sit at room temperature while you prepare the custard. Butter sides of the ramekins above the caramel. Place pear slices on the caramel. In a bowl whisk together eggs, sugar and vanilla extract. 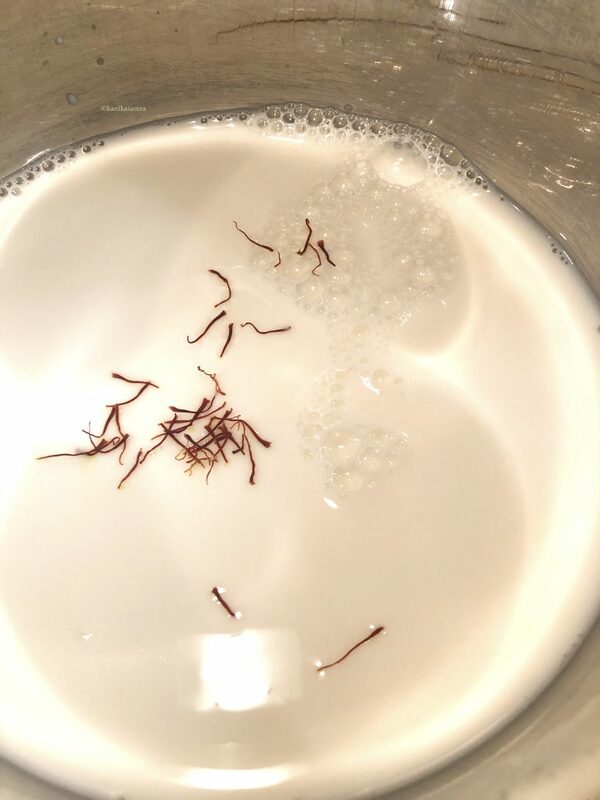 Next, in a saucepan pour all the milk and add saffron strands to it and one crushed cardamom pod. Warm on medium heat until you can barely dip a finger in it without burning – do not boil. Next, pour the mix into ramekins, filling them 3/4th of the way up. Transfer ramekins to the baking tray with its water bath. Bake on the center rack in the oven for approximately 30 minutes. To check whether they are ready, insert a cake tester or toothpick in the center. Once baked, let the ramekins cool down on the kitchen counter. Then chill them in the fridge before turning out and serving. Before flipping the ramekins run a thin knife around the sides, then place a plate on the mouth of the ramekin and turn over. The caramel should rush out and create a puddle. Using pears is entirely optional. I chose to slice them and line the ramekins with pear before adding the custard mix. They will float up while baking. If you want to replace it with another fruit be sure to think about the water content.